Finely chop two thirds of the shallots, one third of the capers, and all of the anchovies. Heat some oil in a frying pan and sauté shallots for approx. 1 – 2 min. Add milk to a mixing bowl and soak bread rolls for approx. 10 Min., until soft. Then, squeeze out the bread rolls to drain excess liquid. Bring a large pot filled with water to a simmer. Stud remaining shallot with bay leaf and cloves and add to pot. In a large bowl, combine ground veal, egg, soaked bread rolls, sautéed onions, mustard, chopped anchovies, and capers. Season with salt and pepper and mix everything together thoroughly. Then, form mixture into 2-in./5-cm meatballs and carefully add them to the pot. Let meatballs simmer on low heat for approx. 15 – 18 min., until done. Remove with a slotted spoon, set aside, and keep warm. Set stock aside. In the meantime, melt butter in a pot over medium heat. Whisk in flour and deglaze with white wine and two thirds of the meatball stock. Add cream and let simmer for approx. 5 min. Add remaining capers along with a little of their brine, lemon zest and juice. Season to taste with salt, pepper and a pinch of sugar. 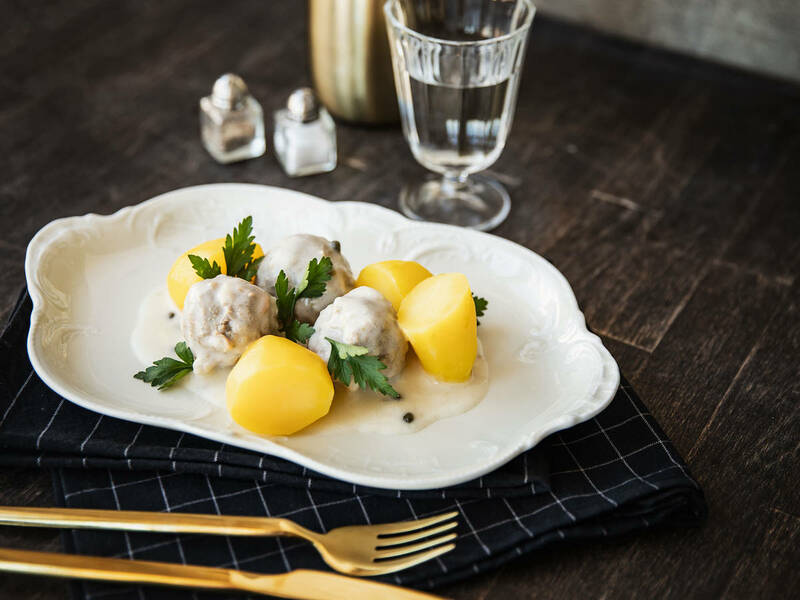 Serve meatballs with creamy caper sauce and boiled potatoes as a side.